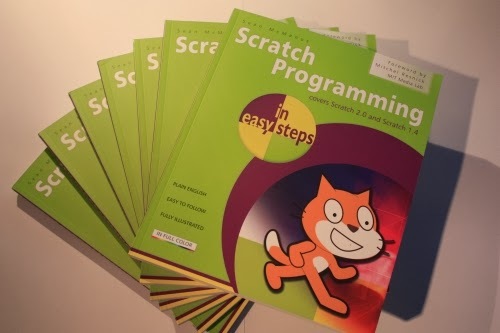 Sean McManus's Writing blog: Scratch Programming in Easy Steps is out now! You are here: Home > Blog Home > Sean McManus's Writing blog: Scratch Programming in Easy Steps is out now! Scratch Programming in Easy Steps is out now! Yesterday was Super Thursday when book publishers release their titles for Christmas. This year, I had a book come out on that very day. My author copies of Scratch Programming in Easy Steps arrived yesterday, and I understand that Amazon pre-orders have also now been despatched. I'm delighted with how the book came out. It's printed in full colour on slightly glossy paper, so I tried to use images that would pop off the page, and the book does look great in print. When I was commissioned to write it, I had a lot of latitude to decide how long it would be. I extended the number of pages from my original plan, so that I could include more example projects (including a chapter of seven short projects) and go into more depth on some topics. I'm particularly pleased with the section on making music with Scratch, which shows how you can convert sheet music into music in Scratch (with thanks to Tim Benson, a friend and former music teacher who checked this spread for me). Together with the inclusion of an abstract art project in the seven shorties, I hope this will encourage readers to be creative with Scratch, making not just games but also music, art and other interactive programs. The book takes a step-by-step approach that shows you how to make a series of games and other projects, but balances that with a full explanation of how Scratch works. I considered that essential because otherwise readers would only learn how to make the project in front of them, and my aim was to enable them to experiment and to create their own projects later. It would be wonderful if readers started inventing their own games and other projects using the knowledge from the book, in the same way that readers of Web Design in Easy Steps occasionally email me to tell me they've built their first website after reading the book. It was important to me that my Scratch book covered the full range of what Scratch can do, too. Important features like lists for storing data are often overlooked in tutorials because they're not easy to incorporate in an arcade game, but I wanted to show readers everything that Scratch can do, so they can draw upon it all in their own projects. Thank you to everyone who pre-ordered the book or has Liked Scratch Programming in Easy Steps on Facebook. Visit the book's Facebook page to take a look inside the book in a new photo gallery I've uploaded there. You can find out more about Scratch Programming in Easy Steps here. If you'd like to buy a copy, here are some links for places you can buy the book.